When Herodotus. 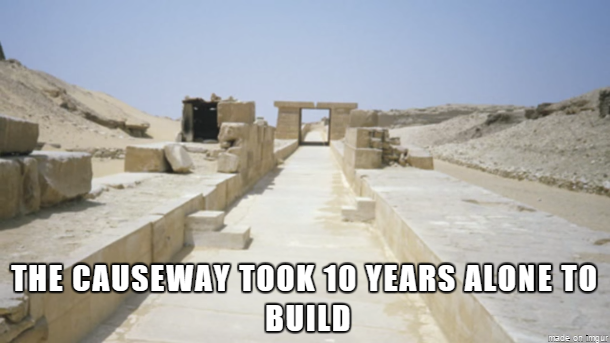 (c.450-435 BC) visited the Giza Plateau, a guide told him that the causeway had taken 10 years to build. 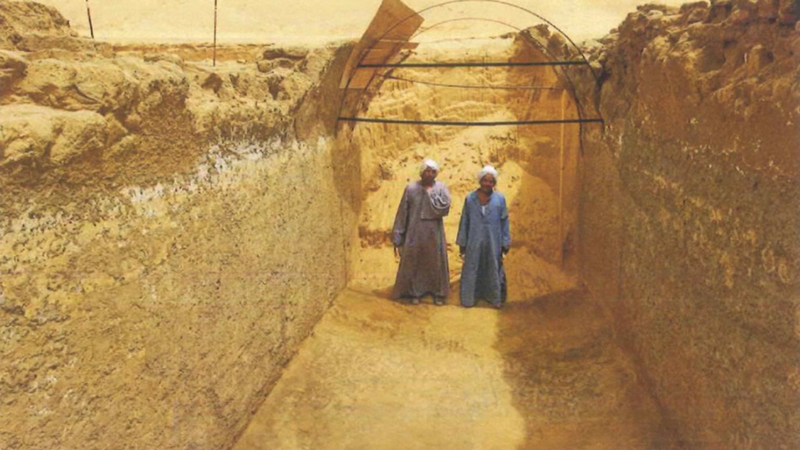 In Chris’s theory he doesn’t see a ceremonial path, he sees a pipe or culvert. Limestone, when first quarried is a softer stone which only hardens when exposed to CO2 in the atmosphere. By immediately submerging the Limestone after quarrying, they keep the stone soft and it is more easily shaped by copper tools. Floating the stones would also allow them to turn the blocks for shaping. The water’s surface could also be used as a level during shaping. The block’s perfection could be measured by a simple level. This shaping would happen in the quarry before floating down the Nile, into the canal, and finally through the Harbor to the Causeway. Quarrying could be done year round, the limestone blocks could be suspended and placed in a water holding area at the quarry. The density of limestone is around 2.5 ton per cubic meter. When placed in water, each cube displaces 1 ton of water. 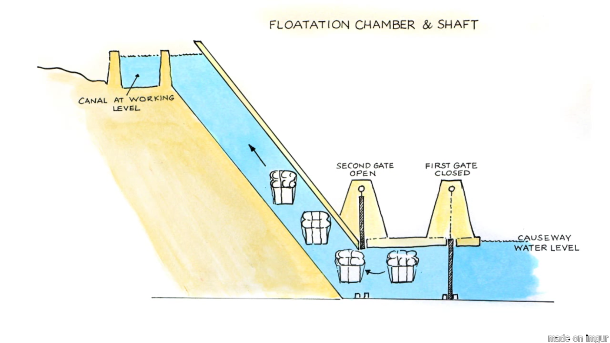 So you only need 1.5 ton of buoyant material attached to float a block of limestone. Cedarwood has a density of around 500 kg per cube, so only three cube of Cedarwood would be required to float each cube of limestone. This could be lowered by hallowing out the wood, or using an even more buoyant device. 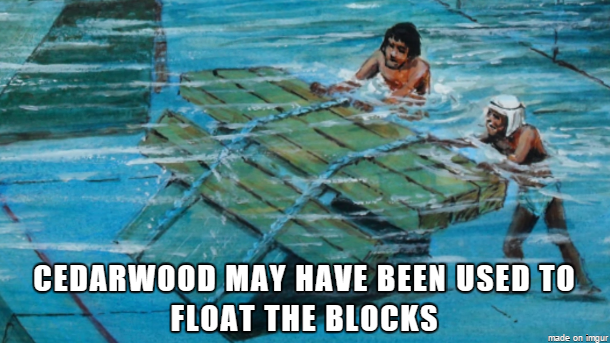 The amount of wood required for this would be unrealistic when compared to the limited forest resources at the time. 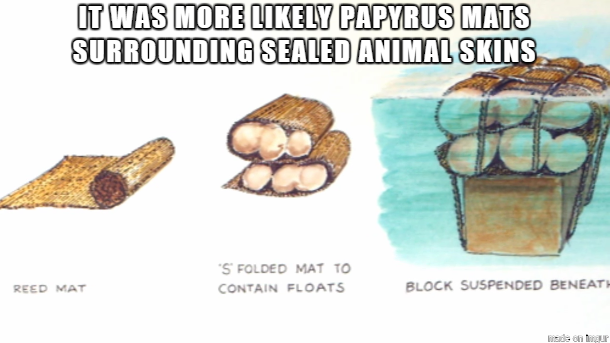 So it is speculated that they may have used papyrus matting wrapped around sealed animal skins. Papyrus is an abundant resource that was widely worked and used by the Egyptians. Animal skins were already used to carry liquids such as wine and water. 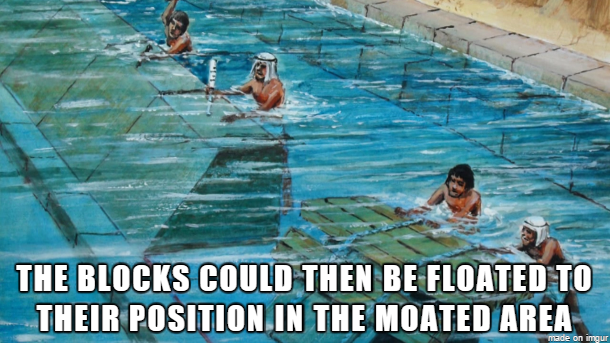 If you think this isn’t possible, remember that traditional theories thought the blocks were floated down the Nile on papyrus rafts/boats. This solution is much safer, as it removes the threat of tipping. The Causeway, as described previously, was seen more like a culvert or water pipe. The first gate’s water level would be even with the harbor, after pushing the floating limestone through the gate, it would be closed. The second gate, which was holding back the water further up would be raised and the blocks would ascend up the hill. How does this work? 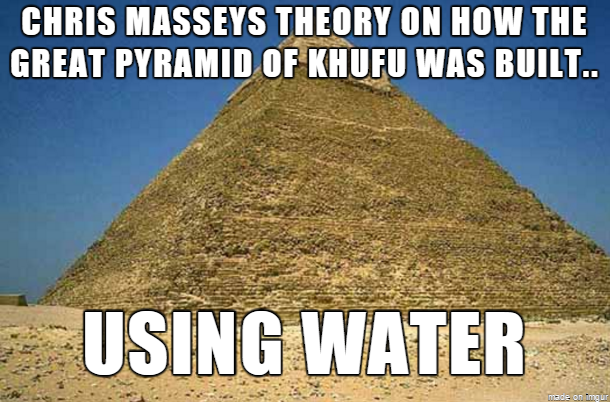 How could limestone blocks move upward in water? Here is a very rudimentary gif to show you visually how it works. Atmospheric pressure is the answer! 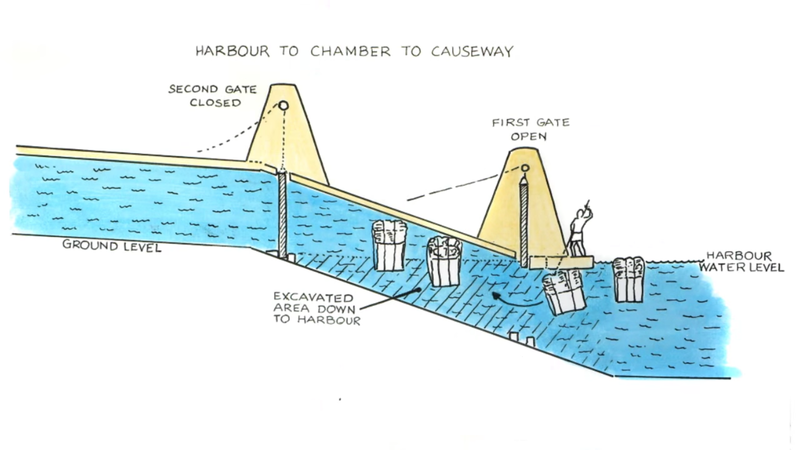 Here is a side sketch of the first set of gates open to the harbor. 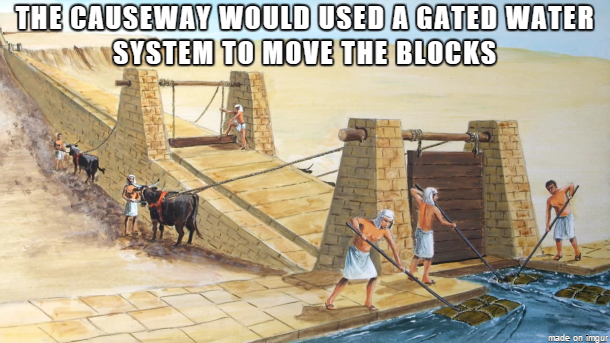 More gates would be necessary up the causeway to relieve pressure on the doors. 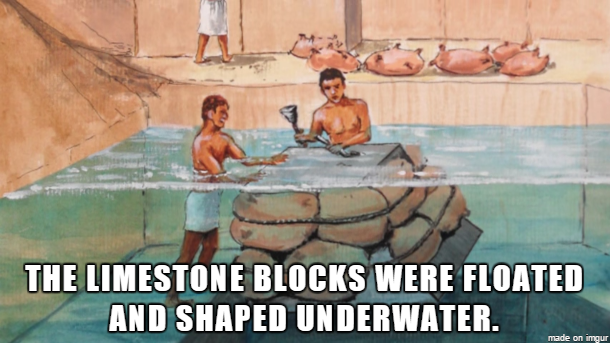 It’s theorized that ropes would be used to connect the floating stone, allowing the workers to pull them up the water pipe. 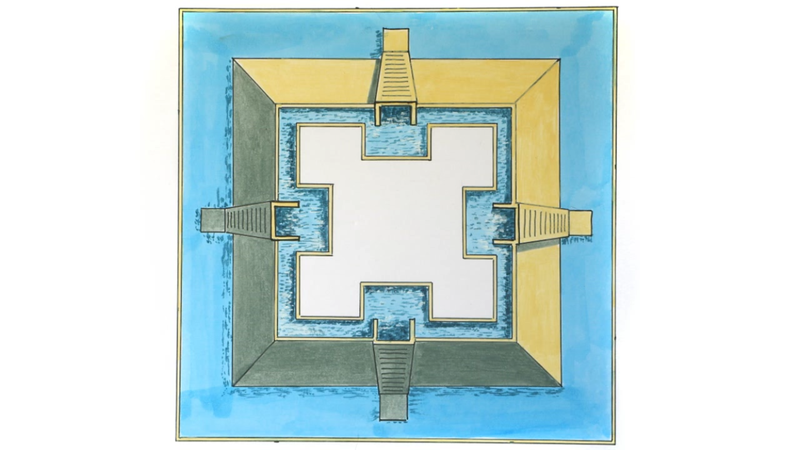 Once out of the causeway via the final gate, the blocks could be floated into the moat and guided to the building precinct. There it could be placed in it’s desire position and confirmed to be level. This would continue until they built past the precinct wall, which was about 8 meters high. To be clear, the precinct is where the building activity is happening, i.e. where the stones are being laid down permanently. Once the building had surpassed the water-filled precinct, another lift shaft would be built in order to ascend the side of the pyramid. (I’m reusing an image to show you this again). Here is a short gif to visually show you activity of the stones moving up the lift shaft. 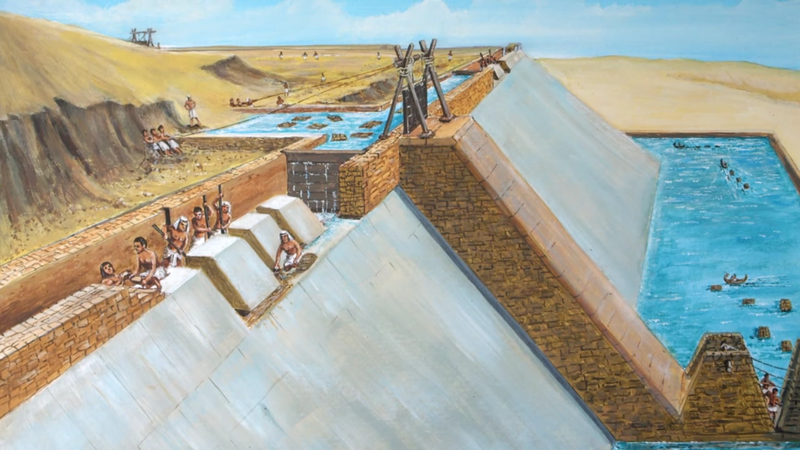 This shaft would be built on the exterior of the pyramid and would be waterproofed using any number of available resources. It’s theorized that a layer of clay was used followed by animal fats, it’s also possible that animal skins and mineral agents were used. Here is a scaled science project using limestone and floats. Once the building surpasses the current lift shaft’s height, the lift shaft would be extended using common masonry skills. Once at the top, the blocks would be floated out into the building area and placed in their position. It’s also theorized that once at the top, they could be dragged out of the water and onto wet mud. The mud would serve as lubrication to allow the blocks to be fitted. Here is an artist’s rendition of what the top of the water lift may have looked like.